DEC 22, 2014 – Busking, or street performing, is when a musician, magician, or some kind of entertainer plies his wares out in public, usually near sidewalks, subway stops or city parks as people walk by, such as the musicians pictured left. Some of the greatest songwriters got inspiration for some of their best songs and honed their craft on the sidewalks of cities across the world. Busking on the street kept them in touch with the real world, and busking also let them make a living as they developed their art. Buskers usually put out an open guitar case, a hat, or a bucket hoping to get compensated for entertaining people passing by with a “tip”. Musicians have to eat too! 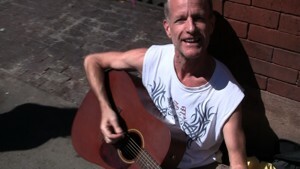 With ever increasing laws and misinformation on this subject of busking, JTMP decided to make a video to educate the public on the subject, and clearly show how busking is a Free Speech right. 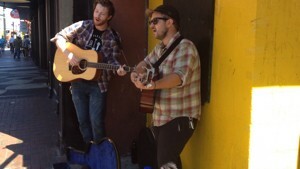 JTMP also visited the streets to talk to buskers and check on the current health of busking in America. Busking on Broadway Street, Nashville! Where would one go to check on the health of busking? The first city in America that comes to mind when you mention street performing, or busking, is Nashville, Tennessee. So, JTMP went down there with a guitar, a camera, busked, and talked to the local buskers playing on Broadway Street. JTMP is happy to report busking in Nashville is alive and well , and I saw there were still many street performers keeping this American tradition alive. 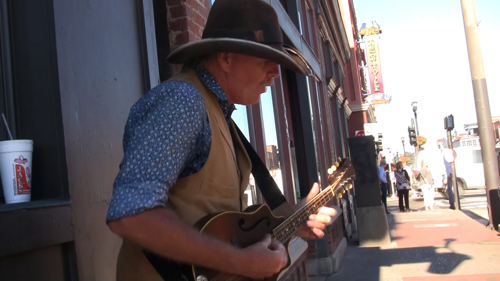 Many of them are also working with the city of Nashville and the merchants to try and preserve Nashville busking on Broadway, to find a way for all to coexist, such as Mandolin Mike of Nashville (pictured above). Great songwriters such as Townes Van Zandt, Kris Kristofferson and Rodney Crowell honed their craft on the streets of Nashville, which is known as “Music City”. Many famous musicians got their start on the streets busking, such as Rod Stewart, B.B. 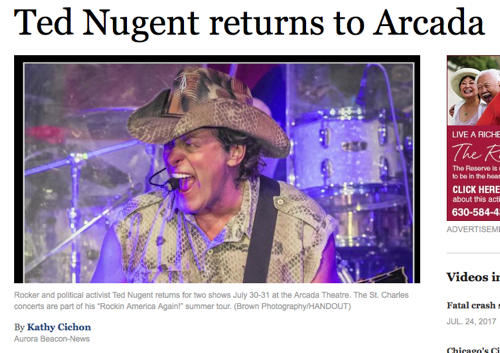 King, Jewel, Bruce Springsteen, Bono, Janis Joplin, Neil Young, Old Crow Medicine Show and many others. 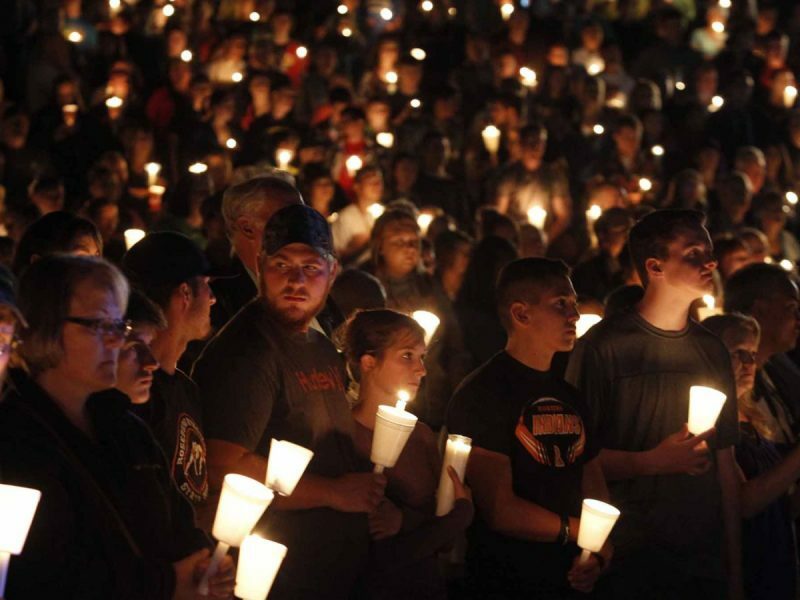 I won’t get into the subject too much anymore, our video below says it all pretty much, but I will add that one day your buddy may bring a guitar to the picnic at the park so you and your buddies can sing an Eagles song or two, and a cop will ask him if he has a “permit” and he will have to leave the guitar in the car. JTMP recommends that our supporters watch our Busking Video below, and make sure your local police and elected representatives are aware that busking is a free speech right. Tell them US courts have routinely upheld that busking is covered by the First Amendment, no permit required, allowing for only minor regulation like restricting the hours or sound level. Also…support your local busker! If you see a busker as you walk to a bar, throw a dollar in his guitar case, he may just be the next Townes Van Zandt! Thoughts? Leave a comment below, comment on the video on YouTube, or start a discussion on JTMP’s Facebook Page. You should also be aware that, in addition to the 1st amendment, you are also covered by the 14th amendment, of equal protection under the law. This amendment has quite a history & gets “worked” all the time by corporations. Here is the specifics: Cities do not require a permit for the following “entities” to collect donations, that are: Religious,Political, or Educational, “where no one person profits”. This wording can be found in City codes across all 50 states. This was successfully challenged In-Re: L.A.P.D. versus Harry Perry, back in 1997, & heard in the 9th District Court of Appeals that decided that what these City Codes grant to non-profit entities, they cannot deny to individuals !!! Further IF You have a booklet that explains your instrument, or your philosophy, etc. this booklet can be sold, at any price, along with a CD that is FREE. You must make this distinction, when you address your audience. The booklet, or even a single sheet of PRINTED paper IS PROTECTED FREE SPEECH. That’s why You can sell newspapers without a permit, in public areas. You have to defend these 2 Rights as Buskers, because Business & their Government servants want to tightly control and / or eliminate our access to OUR Public Spaces. Thank You, & Keep Up Your Good Work, Sean Folsom, a Citizen of the U.S.A.